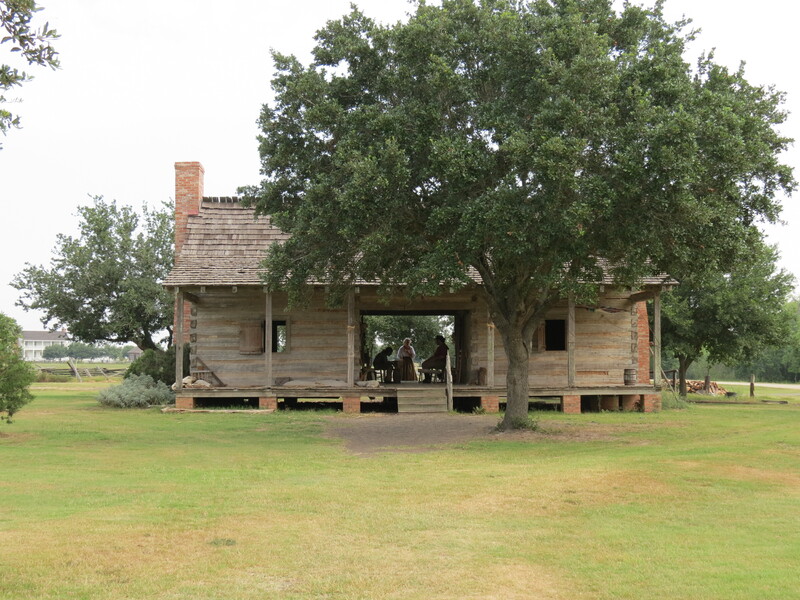 We visited George Ranch Historical Park on Tuesday, one of the hottest June days on record in Houston. It was so hot that there were only 4 other families there in the morning with us, so it felt like we had the ranch to ourselves. 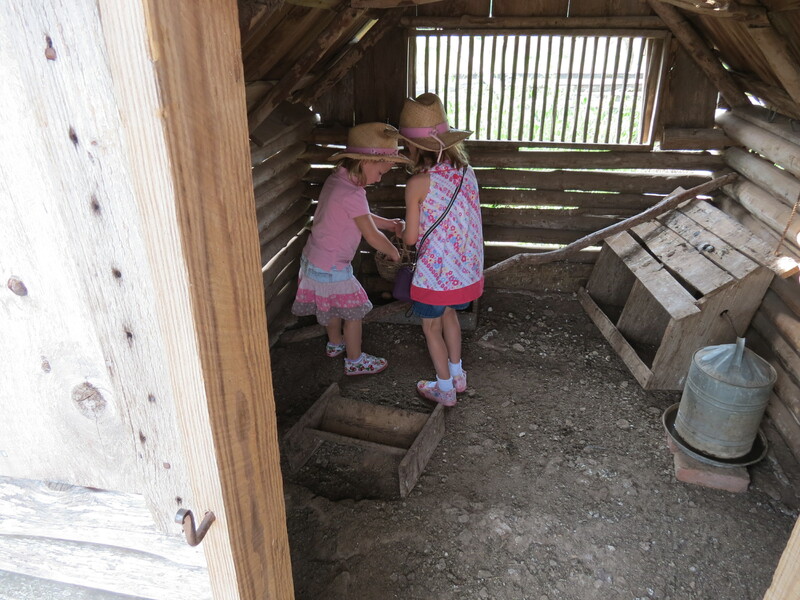 This enabled the girls to ask all sorts of questions and engage with the staff (all dressed up in appropriate period costumes) about the houses, the life of ranchers at different times and their jobs. 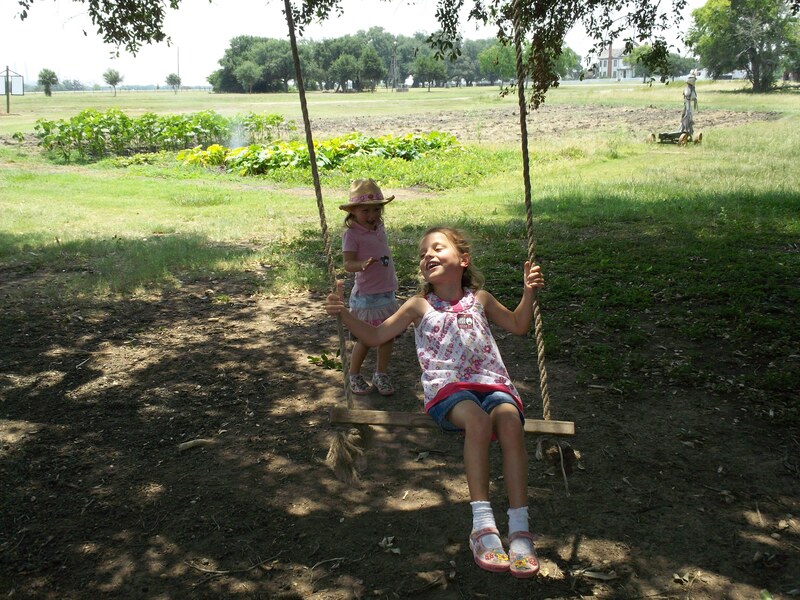 The park itself is over 400 acres depicting the life of one family from 1824 when they arrived in Texas to the 1930s. There are 4 houses from different times and you ‘time travel’ from the family’s earliest time via the houses they lived in. The George family arrived in Texas in 1824 and were given some land and some money to start a ranch. They built the log cabin in the picture above and a few outbuildings to house animals and store food. The cabin had an open passageway through the middle to provide some breeze through the house and cool it down. It needed it today! The people inside playing the family were dressed in period costumes and looked like they were sweltering. The rooms were set out like they would have been at the time – a kitchen in 1 room, a children’s bedroom, where the food was also stored, in the loft and 1 bedroom for the parents, which also housed the loom and spinning wheel. They found 2 eggs and took them back to the kitchen for storage. We walked on to the next house, which was built in the 1860s, and was a huge improvement on the small log cabin. It had a parlour for the ladies and a library for the menfolk (where they could drink and gamble), a kitchen with an oven (no more cooking on the fire) and most likely a cook and servants. We got a ride on the tractor to the next house (it was now very hot) and hurrah, the house had air conditioning! This was to preserve some of the historic objects as the house had been restored to how it would have looked in the 1890s. It was very much grander and the boy of the family was even built an ensuite bathroom (including a fully working toilet) for his 18th birthday. The parents swore never to use the toilet as they’d been told they would be sucked down into the pipe if they sat on it! The girls were fascinated by this and the dining room, where they learnt that children of the time had to learn 200+ etiquette rules before they were allowed to eat with the parents at the table at the age of 14. If they forgot any of the rules, they were then sent back to eat in the kitchen with the servants for anything from 1 week to 6 months. 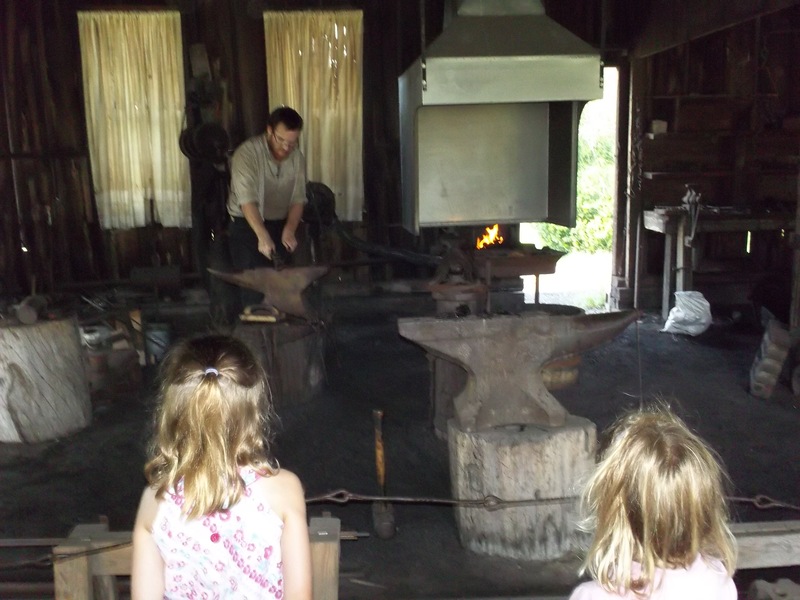 Outside the house were lots of buildings including one with a working blacksmith. As we were the only people there, we got a personal demonstration of how to make a hook with a pretty scroll at one end and a twist in the middle. The Big One was completely enthralled and asked lots of questions whilst we watched. We then headed over to see a share croppers house which was a very small 2 room log cabin, where an ex-slave would have lived and tried to earn a living from the land. This was a very difficult prospect when you had to borrow money from the landowner to buy tools and seeds and the landowner expected 70% of the earnings, plus loan repayments. This arrangement prevented many, many people from creating their own independent livelihoods. The best thing for the girls was a tree swing (see above). They had a great time pushing each other whilst we waited for the tractor to give us a lift back to the main ranch area. We learnt a lot about bobcats and alligators (see here: Our First Alligator) whilst we waited too. 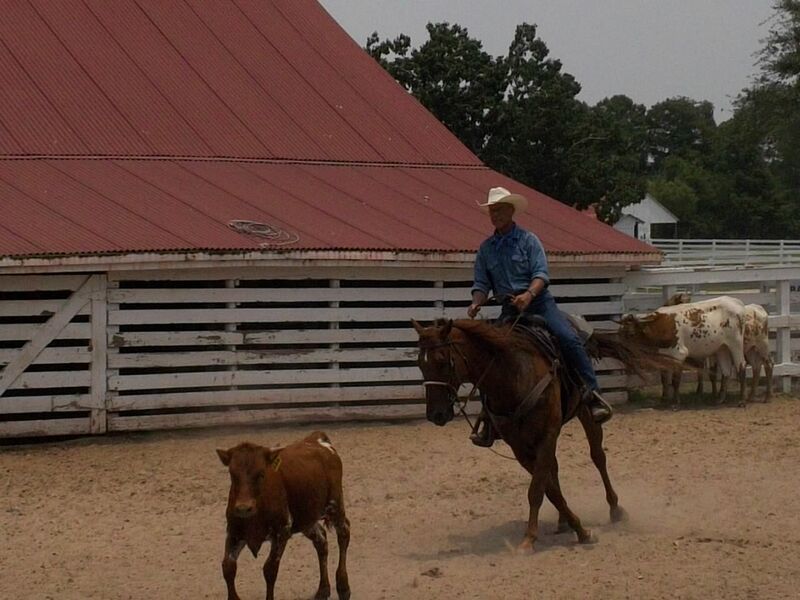 Back at the main ranch we watched cowboys working the cows, learnt about the cows and saw a dipping demonstration. The cows used to be dipped to rid them of ticks which made the animals very ill. The cowboys explained how the cows really liked the water and that calves can swim once they are 4 hours old. The cows then demonstrated this by launching themselves in the dip and jumping from the ramp into the water more than half way across in their excitement to get in! Even the very first picture looks hot! All of these trips look like such fun- I’m jealous. Not of the sweltering heat though!